Combine a vintage look with the intimate elegance of the new blush glitz and then accent it with a sheer romantic fabric and you have a WOW romantic backdrop you will be admiring in your wedding photos for years to come. Call for Pricing! 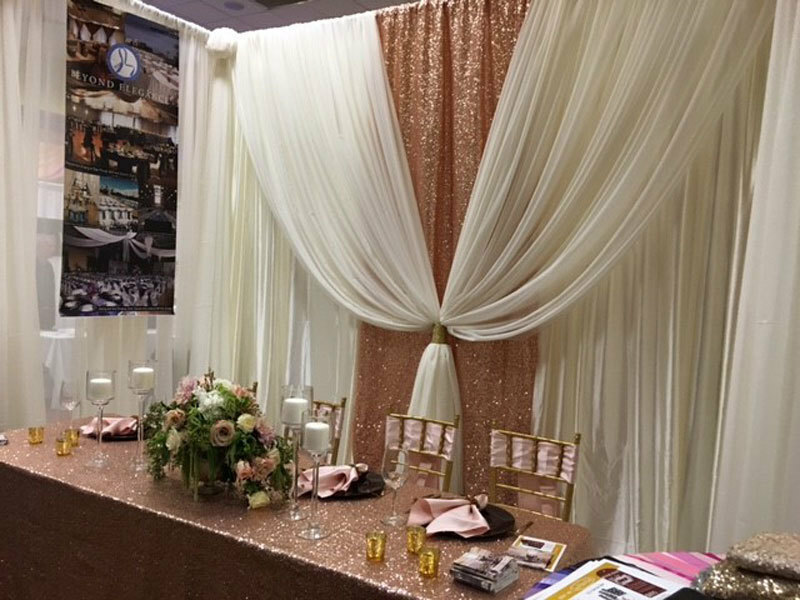 This backdrop is created with a elegant ivory sateen drapes for a backdrop with a blush taffeta glitz drape overlayed on the ivory and then given a 3D effect with ivory sheer drapes overlayed the blush glitz and then brought together with a touch of gold glitz. DIY or setup services available for this backdrop. Call for pricing. NOTE: These items cannot be shipped. Local pick up or setup only.